The floral emblem of Tasmania, Eucalyptus globulus is also one of the most widely used of all Australian native trees. 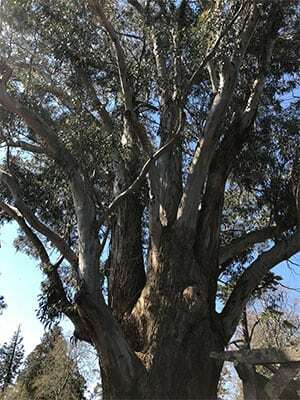 It is found widely in the eastern half of Tasmania, as well as in the Otway and Strezlecki ranges in Victoria. Widely used as a timber tree where it is grown in plantations, also excellent as a large shade tree, windbreak or feature tree in rural properties or large parks. It is also a favourite with bees keepers, the honey produced is unique and valued. Requiring a well drained soil with good moisture this is not an extremely drought tolerant species. Best in rainfall areas between 550 and 1500mm pa with good winter rain. Used widely in forestry situations this is perhaps the most widely grown of all of the Eucalypts. Grown in plantations where the trees are coppiced and the wood used for timber as well as pulp (paper). It is a Eucalyptus that copes better with wet soils than many. This is a species that can be copiced as it has a strong lignotuber. It also regenerates strongly after fire. Eucalyptus globulus compacta ‘Dwarf Blue Gum’ . Eucalyptus globulus labill ‘Tasmanian Blue Gum’. Eucalyptus globulus subsp. bicostata ‘Southern Blue Gum’. Common Name – Tasmanian Blue Gum. Height – From 20 metres to around 70 metres depending on area and soil. WHOLESALE Eucalyptus Globulus or Blue gum is available for sale from the following nurseries.